I think it’s time for me to declare 2015 the “year of fruity beers.” I’ve seen more fruit flavoured beers in 2015 than any other year. Nearly every brewery from Fort Garry, Amsterdam Brewery to Labatt making fruit flavoured beers to battle the heat. Budweiser USA, owned by Labatt’s owners Anheuser-Busch InBev sent out a tweet stating "Nobody cheers for the guy who brings a watermelon wheat beer.” Well.. the problem is that Budweiser’s Bud Light branch of beers produces several fruit flavoured beers ranging from Bud Light Apple to Bud Lime Mango-rita, which I can confidently state taste nasty - they’re trying to flavour a piss-poor product and market it to people who are drinking other types of beers and beverages as they’re sick and tired of the same ol’ Bud Light. What do I think of Budweiser’s Tweet? I think you should check out Parallel 49’s Seedspitter Watermelon Wit at Liquor Marts in Brandon and Dauphin, it’s a fruity, citrusy, watermelon wheat ale that goes well with Friday evening TGIF patio parties and this heat we’ve been having. 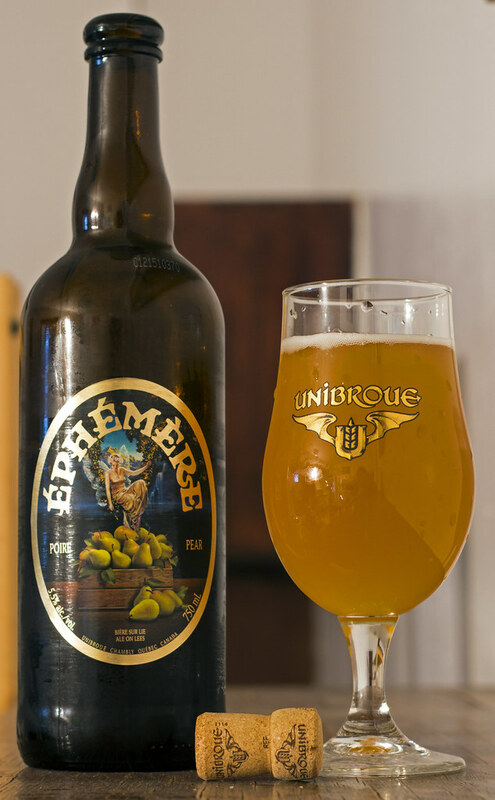 Another fruity beer I’ve been drinking a lot of lately is Unibroue’s Éphémère Poire (Pear) Wheat Ale. As you probably already know, I’m probably one of the biggest fans of Unibroue in the world. I seldom mention them in my column because I find whenever I do mention them, one of their beers ends up exploding in my face (TIP: ALWAYS chill Unibroue beers, even if it tastes better room temperature - you just don’t want to get a cork in your eye and beer all over your clothes.. like I did). Unibroue’s Éphémère line has produced a lot of fruit flavoured beers over the years from apple, cranberry, cherry and even cassis. My absolute favourites were the late cassis and the late raspberry Éphémère. I’m not a fan of pears but I can’t seem to get enough of Éphémère poire. Poire pours a hazy golden straw, very cloudy, incredibly carbonated and fizzy. A bit of a creamy white foam on top that gently fizzes away. The aroma gives me notes of freshly sliced pears, notes of bubble gum, Belgian yeast to give it a bit of a hint of bread, a bit of apple core and just a hint of lemon. The beer tastes like it smells, the yeast makes a big appearance in this beer to give it more of a bready bite to it, notes of pears, apples, light herbal notes, lemon peel and some bubble gum sweetness. TIP #2: Unibroue is pronounce uni-brew, not unibrow. Éphémère is pronounced eh-fay-mare.